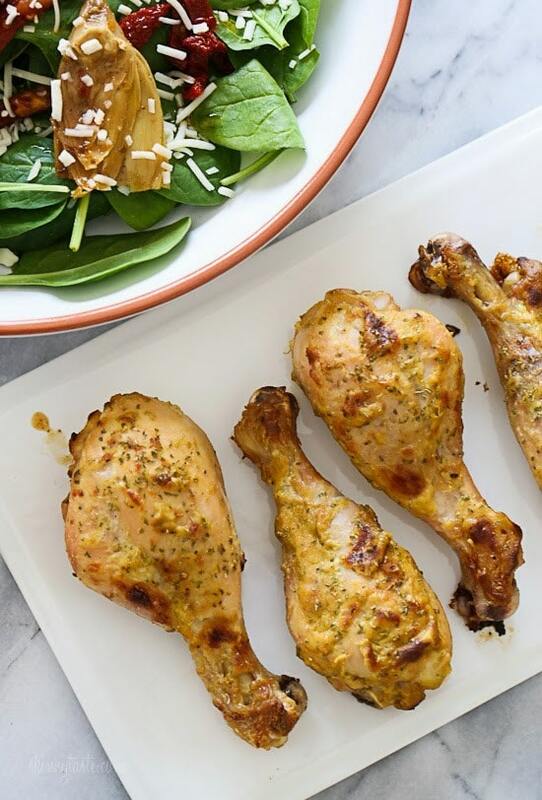 Easy weeknight dinner solution – grab some chicken, remove the skin, brush it with this Dijon-lime sauce and put it in the oven. You can make this with thighs or even breast if you prefer! 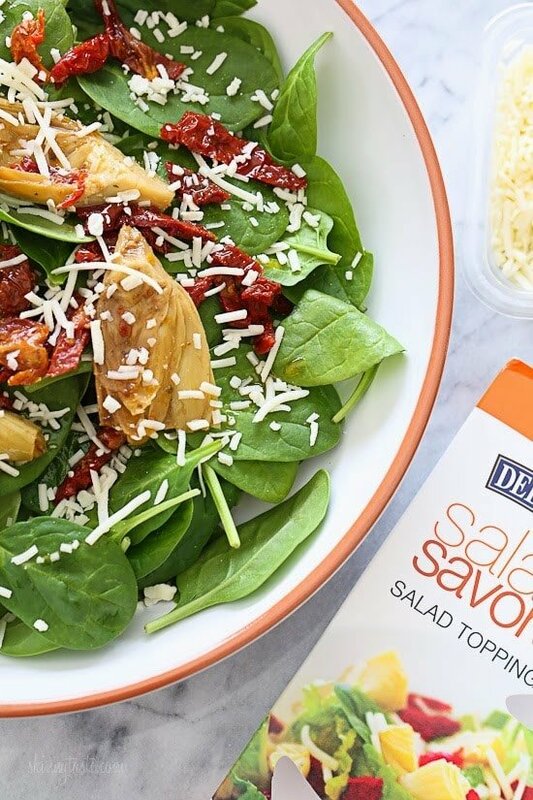 While the chicken’s cooking, grab a bag of lettuce, and top it with one of these delicious DeLallo SaladSavors® that make life so easy. These are the BEST, and come in 6 varieties with top quality ingredients. All you have to do is add some oil and vinegar, and you have an amazing salad in 5 minutes. My favorite is the Zesty which has marinated artichokes, sun-dried tomatoes and Asiago cheese pictured below. Rinse the chicken and remove the skin and all fat. Pat dry; place in a large bowl and season with salt. In a small bowl combine Dijon, mayonnaise, lime juice, lime zest, garlic and pepper. Mix well. Pour over chicken, tossing well to coat. 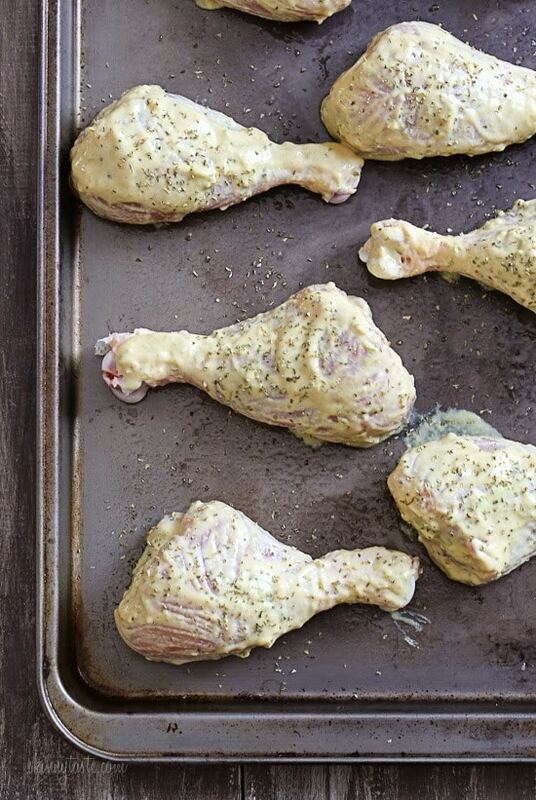 Spray a large baking pan with a little Pam to prevent sticking since all the fat and skin was removed from chicken. Place chicken to fit in a single layer. Top the chicken with dried parsley. Bake until cooked through, about 35 minutes. Finish the chicken under the broiler until golden brown, 2 to 3 minutes. I just made this chicken tonight with leg quarters I left the skin on I smeared the sauce under the skin and on the skin. I tasted the sauce and it was a bit puckery. so I got my truvia nectar and squirted that in, not to make it a sweet sauce but to balance out the puckeryness the mustard and lime. husband and I both enjoyed it. if you didn’t want to eat the skin you could peel it off and you still have the sauce underneath giving flavor to the chicken meat. Would this recipe work in the Air Fryer? Not too sure, I haven’t tried it. I am a big fan of your lemon feta drumsticks in the slow cooker and tried this recipe since it seemed similar. My husband LOVED this one. Will definitely make again as a switch up! What would the Frestyle Points be if made with chicken breast instead of drumsticks? Made this with boneless skinless thighs, delish!!! Could these be grilled or would it just burn them? Always make this and sometimes jazz it up with 1/3 cup plain breadcrumbs and 2 tbsp. parm/romano cheese, throw all the other ingredients along with the above into a zip bag, shake around then on the cookie sheet to bake and either way is a winner. Would these work in slow cooker? 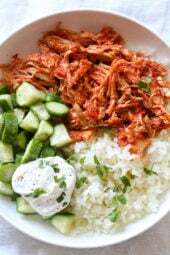 To make this recipe Whole30 compliant – what should I substitute for mayo? The Smart Points on this recipe are way off. Since a serving is 2 drumsticks and one drumstick with or without skin is 4 points, that makes at least 8 points, not counting the mayo. The recipe has a serving as 5 points, but that would only be for about one drumstick, not the full serving. Hi Danielle, I rechecked and still got 5 smart points for this one. WW has an option- “Chicken drumstick, skinless with bone, raw” that’s 2 smart points per drumstick, which is what I used to calculate here. It’s 4 smart points for the chicken, and the rest of the ingredients bring it up to 5. Can I grill this instead of baking it? This was so good!! I noticed a few others mentioning they found the sauce tart so I tasted it before putting on the chicken, and I found it a touch too tart for me so I added just a bit of pure maple syrup, it was absolutely delicious! Hi! Wonderful recipe! We are such a fan! One thing, I do miss the old printing app. It would let me choose what to print as well as print the pictures of the food. The pictures are a must for us since it let’s us find the recipe we want in our makeshift cookbook. Really miss that. Otherwise, love the new site, thanks for sharing!! I've made this twice now. First with skinless drumsticks, and tonight with skinless, boneless thighs. Quite good! I use 2 garlic cloves, seated on the microplane zester (I already have it out for the lime, so why not?!). I add a little paprika and just eyeball the measurements for the other ingredients. Broiling it at the end really does something special for it, and I'd never have dreamed that up on my own. would substituting lemons for limes work out? Yes… I have used 1 lemon (big and… sweet) and it tastes delicious. Not sweet but less bitter than lime. Try it with lemon, you won't feel deprived… Good Luck ! I'm substituting the maywith low fat Greek yogurt. Hope it turns out just as good. How did it turn out? I was wondering the same! Wow!! This was so delicious and easy to make!!!!!! Thanks, Gina! ohh…those salad savors look good, especially Zesty and Fresh! So I made this tonight with chicken tenders and it's so good… do you think I can freeze the leftovers? 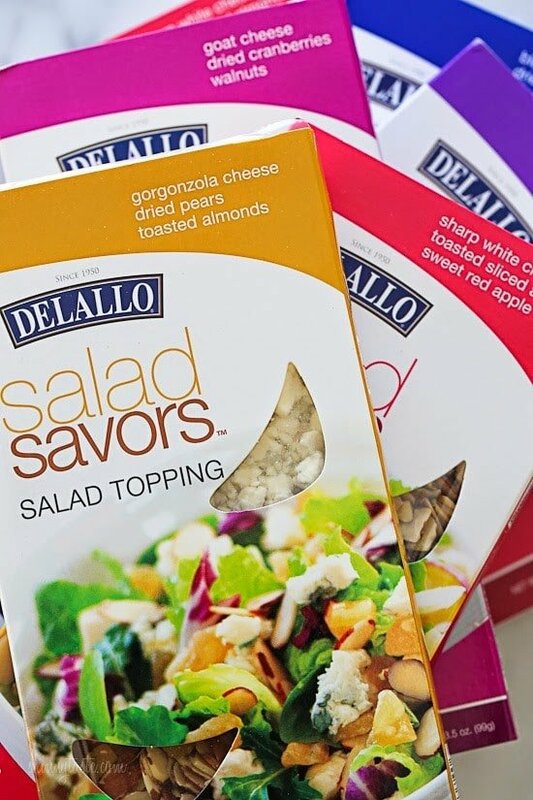 Where can you buy the DeLallo Salad Savors? I couldn't find them at my grocery store. I'd try the Gorgonzola cheese DeLallo flavour packet – yum! I made this recipe last night along with the roasted cauliflower. Absolutely delicious! I haven't made a Skinny Taste recipe that I did NOT like! 172 calories and 6 pts? Are the points/calories correct? 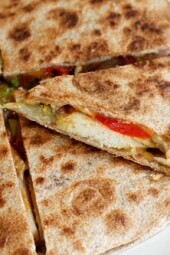 Dellalo packets look amazingly good….where can one buy them? I think that this will be dinner tonight. Don't have a lime, but maybe my lone lemon will do. I just bought a big bag of limes and a big package of chicken legs. Trying this tonight. While I've recently tried a variation of this recipe with the chicken meat being fried, I'd say baking/roasting it is far more pleasant for me. This looks wonderful Gina and that salad looks fabulous! Wondering if I can use nonfat plain yogurt instead of the light mayo? Where do you find the delallo salad fixin's? In the refrigerated section or produce? I have made this twice and we LOVE it! The sauce is amazing and the lime zest came through just right—made your recipe exactly as written. My husband is on low carb and it was a real treat for him. I made this tonight with boneless, skinless breasts and marinade did not stay on. Pan was full of juices (watery) when I tried to broil it, it didn't do much, the chicken still looked boiled. My bf hates boiled chicken so this was a complete fail. Any suggestions to prevent this watery, boiled mess Gina? This has been my go-to weeknight recipe. it's perfect every time! I serve with cilantro lime rice or a veggie side and everyone always RAVES! I pretty much always make a double recipe, but triple the sauce because I love to drizzle it over the rice, and leftovers are a perfect lunch. 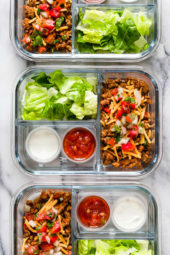 Thank you for helping me keep my eating on track! Why go out when you can make something delicious at home? I just found your site 2 wks ago and I love it. I am following the WW plan and am so thrilled. I have a very picky husband and it can be difficult to stay on plan with him. He really liked this recipe. It will be going into the rotation. Thank you for the wonder recipes and pictures you post. I make making them easier as I know how thing should look. Made this and used some avocado instead of mayo and it was delicious! Idk why every time I bake chicken why so much water comes out that it take all the marinate comes off. So then my chicken is flavor less. This…was…AWESOME! My fireman hubby loved it! This was really good. My only criticism is that it was maybe a bit too flavorful. Next time I'll probably halve the recipe and add some oil to balance it out. I have made this twice and love it. However, I just finished preparing to make tonight and I can't remember if I covered it while it was baking. Can someone help please? This is absolutely delicious, by the way. Possibly dumb question: do you just dump out the lime/mayo/dijon mixture after you put the chicken in the pan? Or do you pour it over before baking? What is considered a small chicken thigh? Making these tonight, since my dad gifted me with a huge package of these from BJ's. Smells great in the oven now (and I don't usually like dijon, but you never steer me wrong!). I made this twice this week actually. On Tuesday made the exact recipe and then Thursday, forgot to set the slow cooker so I made it with split chicken breasts and lemon (since I didn't have the lime) it was a delicious and easy recipe! Thank you! This is the best chicken recipe ever. My family loves it. My son said "Mom, are you making that dijon chicken again"? When I siad yes he said Awesome and licked his lips! It's the greatest! Thanks Gina for all of your recipes! YUM YUM YUM! It was so good and flavorful. My 6 year old said it was his favorite chicken. THANKS Gina! This dish just got named "Kickin Chicken" in my family because it is such a big hit. All thanks to you! Love your site! is there an alternative for the mayo? We have an egg allergy. Love this dish, made it last night with boneless chicken breasts and it was DELICIOUS!!! I want to try this tonight but I was a little confused. The serving size says 2 thighs 5pts+ but the WW book says that 1 thigh is 4 pts. Just made this and it was delicious!! Hubby liked it and he doesn't like thighs! Very easy to make. I didn't have enough mustard so I combined Guldens spicy brown, yellow mustard and Kosciusko. YUM YUM!! Easy and delicious! Works great w boneless skinless breasts too! I tried this last week and both my husband and son loved it! I liked it so much I decided to use the same sauce on some tilapia loins I had in the freezer and it was great too! Love your site and hope you get a cookbook soon! Been making things on your blog for years now! Just had a question about how tart this was. My bf loved how juicy the chicken was but said it was a bit harsh on the tartiness. Anyone else have this problem? Any tips on avoiding this in the future? I tried this last night and it was wonderful. I think it's good enough for a re-post! This is really good! Took less time than I was expecting and so good! Thanks! Just tried this with boneless skinless chicken breasts, it was great. My fiance loved it! I followed this recipe to a T. It was decent – definitely more of a plain chicken recipe. Served this with the orrechiette and broccoli recipe you have on here, so it worked. I will say though, the chicken was super tender inside.. I made this last weekend and I LOVED it! The chicken was full of flavor even without all the skin and fat. Made tonight with boneless breasts, and only cooked about 23 minutes – turned out great, as everyone has already stated, and my husband suggested that we try it next time with fish. Has anyone else tried that? It sounds great! It is funny to watch my posts on Pinterest…pretty much all the recipes from this site go from "recipes I want to try" to "healthy and delish!" immediately! Again, thank you for all the great healthy ideas! One of my favorite recipes yet! It was so delicious! I loved this dish. We used boneless/skinless chicken thighs, so that made the labor much easier. The marinade is delicious! Will definitely make again. I just looked through this thread and I noticed that several people asked whether or not there was a decrease in points for using chicken breasts instead of thighs, does anyone know the answer? 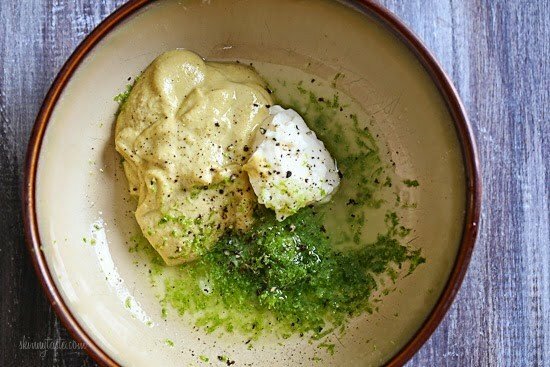 I tried this last night – absolutely delicious and so very easy to make. Thx! This is in the oven right now. Can't wait to try it! Making thighs for my grandparents, husband and son and breasts for my daughter and I. The mustard-lime-garlic mixture smelled so good, I could have eaten that I think! Would this work with shrimp?? I absolutely love this recipe! I make it with chicken breasts and it's delicious! Thank you!! Can I replace the mayonnaise with more dijon? Another fabulous recipe! My husband never believes these are "weight watcher" recipes. Delish! I served it with roasted asparagus and basil-parmesan quinoa. I made this tonight and all I had was boneless skinless thighs (really should be the same NI since I'm not eating the bone). I had 7 thighs which was 2 pounds…I put the recipe in the WW recipe builder and it was about 13 points for 4 servings. Not sure how you got 5+ unless you had teeny tiny chickens. My thighs seemed average size. trying this tonight! 🙂 cant wait! This was OUTSTANDING!! I made it last night and everyone asked for seconds (including my three kids) Thank you!! I am making this now, will know in another 25 minutes or so how it will turn out. Kind of nervous. Im such a picky eater and I just signed up for weight watchers. But this was super easy and I had all the ingredients. Making drumsticks for the first time.. Fingers crossed!! This must be the millionth time I've made this dish, and it finally dawned on me that I owe you a big 'thank you' for introducing it into my life! Love, love, love this baked chicken! Wonderful. I have made it several times then shared the recipe with my stepmom who has no computer and is allergic to many foods. She loved it. Thanks so much. This has become a weekly staple in my house. So easy to put together in just a few minutes and it always comes out mosit and delicious. I have used chicken thighs, legs, and breasts and just adjusted the cooking time and they always come out so good! Thanks for such great recipes, keep 'em coming! My boyfriend is the chef in our relationship, and I'm the baker. Tonight I cooked dinner for him as a treat, and made this chicken – it turned out fantastic!! Great flavors and not dry at all! I made this last night and we LOVED the flavors! The only thing I did differently, was use a grainy mustard because that was all I had on hand. Turned out moist and delicious! Thanks for the wonderful recipes! made this tonight it was DELISH!! thanks! !